As I was saying, Kamala Bastralaya exists no more at the corner of Manoharpukur Road and Rashbehari Avenue, but the roads themselves are yet to disappear. In fact, even though aged, they continue to bear the stigma of the names assigned to them at their birth. Unlike wizened old cities that is, like Chennai and Thiruvananthapuram, or Kolkata itself for that matter. As you cross Rashbehari Avenue from North to South, near the corner that never fails to extract a sigh out of me, you part company with the lilting twists and turns of Manoharpukur Road and walk into Lake View Road, which leads you straight on to the Dhakuria Lakes. In the language of mathematics, if Manoharpukur Road were to be viewed as an nth order polynomial curve, then Lake View Road is the closest approximation to strict linearity. A no nonsense look so to speak that it has borne since the day at least that I was carried home displaying unmistakable signs of a new born baby. At the intersection of Lake View Road and Jatin Das Road, where Jeloka House towers still much to my disbelief, you need to take a sharp left turn and move eastwards along Jatin Das Road, past the pink building that used to belong to a grumpy old man (who, till his last days, stuck to his single minded grouse against youngsters, that they didn’t look after the stray dogs of the locality), till it forks out into a left and a right branch. Around four buildings down the right branch stands a three storied white washed bungalow and it was in the rented ground floor apartment at the front of this building that I transformed into a biped from a quadruped and even learnt the first few human noises I managed to produce. Like Jeloka House, the total changelessness of the building took me by surprise when I landed recently on this stretch of Jatin Das Road. How many of the occupants of the premises as I knew them are still a part of the temporal world I didn’t venture to guess as I stood across the street and viewed the windows that I was so familiar with in the distant past. The perspective then was different though, for I used to stand inside my home and watch the world outside instead of being a part of that same outside as I was now. I wondered if it was I instead that was now the object of scrutiny. Unlikely I thought of course, for the shutters in the green windows were firmly pulled down. Perhaps this building had seen too much for too long to be interested anymore in mortal happenings. The multi-storied condominium that stood bang opposite and stared back at the older house with supreme disdain today was non-existent when I had started life. In its stead, there was a green plot of land surrounded by a waist level wall on three sides, a playground for children during those long lost afternoons. On the far side, beyond the boundary wall there used to be a yellow, two storied house occupied by a Chinese family that has now disappeared along with the house itself. It was the back of the building that faced our dwelling and my mind to this day cannot resist the temptation of climbing up the rusty spiral staircase that clung to its wall and disappeared through a door into a world of mystery. The morning sun that rose behind my home lit up the yellow house with its first rays and this is invariably the picture I have associated since childhood with the arrival of mornings. The back of a sunlit yellow house standing immediately beyond the patch of a green playground. The green bid us good bye with the arrival of Dr. Sen who built up his residence on that plot of land. The yellow house disappeared too behind Dr. Sen’s construction and our playground spilled over to the pavements and the street. Soon neighbourly relationships grew up and Dr. Sen’s youngest son, Sudip or Bachchu, and I turned into playmates. His eldest son, Prateep-da, was still finishing his medical degree and at some point of time he left his home for foreign shores to earn an FRCS degree from Edinburgh. It was the second of the three sons, Sunip, who stood out amongst the three sister-less siblings. Not because of his achievements, but for his handicaps. Unlike his two brothers, both of whom were good sportsmen, Sunip, or Sunip-da to me given our age difference, suffered from a serious ailment, related I think to his heart. His mother visited our home often as ladies used to in those days of yore. And my mother learnt vaguely about the problem, perhaps the only problem, this upper middle class household was afflicted by. Sunip-da had to be kept under perpetual medical care and was strictly forbidden from undertaking physically arduous tasks. The result was that while his brothers went for medical and engineering degrees, Sunip-da was sent to an Art School. I have no idea how deft he was as a painter, but he managed to clear his exams. The mother was certainly not an impartial person and, though she did not display aversion towards her physically well-equipped sons, she was more than preoccupied with Sunip-da’s health. And Sunip-da did need all the attention in the world, given his telltale look of sickness. The contrast with the brothers was quite obvious. They were tall and well-structured, while Sunip-da was short and emaciated, his thick myopic glasses providing supporting evidence of his fragility vis-à-vis a world he lacked the equipment to cope with. The Sens were wonderful neighbours who, despite their material success compared to others in the locality, were good friends, always ready to extend a helping hand as we were growing up through school and college. Bachchu was two years senior to me. I was probably doing my Bachelor’s degree in college and Bachchu finishing his engineering course when Dahlia metamorphosed from a girl to a young woman. A woman that bloomed with a vengeance, doing full justice to her name. She lived with her family right next door to the Sens and Bachchu had fallen head over heels in love. This was open secret to all, but there were problems that loomed large for him. Dahlia was a Brahmin, one of the prettiest one could have ever had come across, and Bachchu, though handsome, was not a Brahmin by any stretch of imagination. Hence, there were complications that one heard of, originating from the direction of Dahlia’s family. But Bachchu was a sportsman who played his best to win. Fortunately for him though, Dahlia reciprocated with a gay abandon and Bachchu was soon the firm owner of her heart, but her father or mother (or whoever else I know not) were not yet ready to play ball with either Romeo or Juliet. Dahlia kept on blooming ever brighter as the days progressed Marriage proposals were jamming up the living room in her residence as Bachchu agonized under a cloak of dark silence. Although Dahlia was his forever, I suppose he was not yet ready to elope. We youngsters were already familiar with their secret rendezvous spots, though we didn’t know the plans, if any, that were hatching between them. Matters concerning the heart have a propensity to afflict without bias. Consequently, as Bachchu’s roaring relationship with Dahlia was travelling at supersonic speed, the heart patient in his household, Sunip-da, was passing through a turmoil of his own. Except for the fact that no Dahlia had as yet shown up in his life. The result was that the entire world full of budding womankind turned into potential Dahlias in Sunip-da’s eyes. He didn’t exactly chase girls, but the way he was staring at all the girls in the neighbourhood made their parents wary. And the wariest of all was his own mother. Given the physical state of his heart, the specialists had advised against marrying him off. As a result, his ailing heart was desperately wailing. So loudly and clearly in fact that his parents, especially his mother, were finding it far too difficult to make him stick to his diet of strict celibacy. The eldest brother, Pratip-da, must have been married by then. It was Sunip-da’s turn and Bachchu the youngest was finding it embarrassing to bring up the question of his wedding before his elder brother was married off. This was a tough situation. For Dahlia, as I said, was not in a position to wait much longer. Bachchu’s friends wondered if he was planning to jump the queue. But then one day, Mrs. Sen came over to our home with an invitation card announcing Sunip-da’s marriage. A marriage it seems had been arranged, a risky matter as she told my mother. But it could not be avoided anymore if Sunip-da was to be kept away from a lunatic asylum. And one balmy evening, Sunip-da dressed up as a bridegroom, set off on a trip to marriage-land, accompanied by all the young people the family knew and I still remember the great feast we enjoyed that evening. In fact, the wedding reception was arranged in a hall located three houses down Kamala Bastralaya! Walking distance from my home too. There was great fun and frolic and Sunip-da was smiling at last. He came back home with his young bride, whose name unfortunately I cannot remember any longer. But I do recall that she was pregnant soon after the wedding, which was only to be expected, given the state to which Sunip-da had been reduced during bachelorhood. Bachchu too probably began to feel relieved, now that the barrier in his home front had receded. And it was exactly at this point of time that Sunip-da died. Leaving behind a wife and an unborn child. No one found out the precise details of the cause of death, but it appeared that he had slipped past a step while coming down the staircase. He rolled down to the ground floor losing consciousness, a loss that remained doggedly uncompensated. They put him inside a ventilator of sorts, or whatever it was that used to ventilate in those bygone days, without success. Dr. Sen, with all his medical connections, failed to bring his son back to life. A pall of gloom had settled on that evening on the right arm of Jatin Das Road, with neighbours standing in silence on the road adjoining Dr. Sen’s house. The silence was so thick that one could cut it with a knife. Then the time came to lift Sunip-da’s lifeless body and start towards the crematorium. Following Bengali custom, someone gave the lead: Bala Hari, Hari Bol. This was a cue for a piercing cry, a heart rending scream emanating from the voice of the departed person’s mother. It broke the silence like the noise of shattered glass. I can still remember vividly what she had said repeatedly on that dismal occasion. With whatever strength she had at her disposal, she kept on demanding: Where are you taking him, where are you taking him, where are you taking him, no, no, where are you taking him …? Like all fateful evenings, this one too was over and morning arrived as it never fails to. Dr. Sen’s family slowly found back its strength to face up to life and begin to hope too as the day of the baby’s arrival approached. 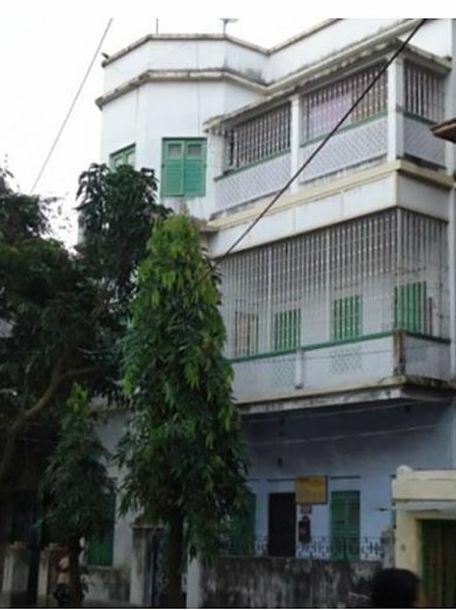 Sunip-da’s young widow was often visible on their first floor balcony, vacantly staring at the street. The baby to be born was not the only hope that was being nurtured in that family of course. For Bachchu still had his Dahlia to be shifted over from the neighbouring building to his own. His task was now ever harder to accomplish. Even if Dahlia’s parents were to agree, it was no easy task to raise the question of a wedding with his own parents. How Bachchu managed to solve the problem I can’t tell. But Sunip-da’s child was yet to be born, when Dr. Sen arrived at our home with a fresh wedding invitation. He was crying more than smiling, but he had to do what had to be done, for Bachchu must have put his foot down. The wedding ceremony turned out to be a simple affair despite their means, and compared especially to the revelry surrounding Sunip-da’s wedding less than a year earlier. This was inevitable, since the yet to be grandparents barely managed to remain floating in their sea of sorrow, as time, cruel time kept the human drama alive. I looked up again at the white house that had seen it all, and which I hadn’t. I left India for a distant destination before this tale had reached its denouement. But Einstein had told us, the universe with its space and time components tends to bend back on itself. No wonder therefore that I had come across a friend from this area, Tapas, many years later. He was visiting his daughter in Delhi and dropped by to see me at my office. As expected, the conversation veered on to the days gone by. And I asked him about the rest of the story as it had unfolded in Dr. Sen’s home. As I heard him out, I realized that some tragedies at least continue without end. Sunip-da’s wife, I was told, gave birth to a son who became the apple of his grandparents’ eyes. They doted on him, which was natural, but the doting crossed bounds of propriety. He turned into a hopelessly pampered boy by the time he reached his adolescence. He grew up into an unemployable of sorts, one with no future to look forward to at all. At some point, as expected, Dr. Sen and his wife passed away and probably property disputes followed. The house was sold off and the condominium whose shadow I stood under came up in its place. Tapas didn’t know where Bachchu and Pratip-da had gone away to, but whatever their destinations might have been, they had lost all touch with the right arm of Jatin Das Road. Perhaps the story is over now, but a whimper of an epilogue is still in order. Back in Rashbehari Avenue, I was sitting one day inside a shop purchasing a wall clock I think. Suddenly, as I looked out of the shop, I saw Bachchu passing by. An elderly, much changed Bachchu. Closely behind him was Dahlia, who bloomed no longer. Two middle aged persons going their way. I could have rushed out of the shop to greet them. But I didn’t. They were a part of my bygone past. That past, I felt, was no more revivable than Sunipda himself. Like Manoharpukur Road, Rashbehari Avenue, Lake View Road and Jatin Das Road, the whitewashed house I was facing has survived the ravages of time. It had witnessed children playing on that patch of green beyond which stood the yellow house. And it had seen the rise and fall of the Sen family. Along with Sunip-da though, the yellow house where the Chinese family had lived is itself no more, but unlike him, it still shines brightly in my memory. That’s where mornings will always begin for the rest of my own life. This is an idea worth trying out. An idea that can lead you on to an idea of your own!! I’m starting something new. I’ll be sharing a weekly writing prompt, which will involve a tune. I hope you enjoy this series. I have a diverse knowledge of music, so I’ll try to mix it up quite a bit. And since I’m starting on Wednesday, we’ll keep it on Wednesday. I think being able to listen to all kinds of music for writing purposes is important. Whether it’s listening to the sort of music a character would listen to, or if you’re writing a period piece listening to music of that period, it’s important to familiarize yourself with music that would fit within your story. That might be playing on the jukebox during a bar scene, or playing on a character’s iPod. Does anybody really bother with iPods anymore?